The ACLU continues to harass the church in cases with very little basis for preserving "civil liberties". 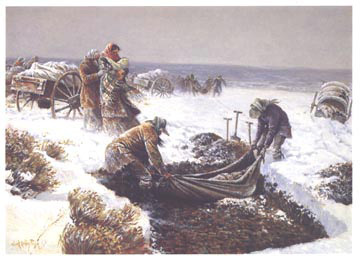 This week in an out-of-court settlement the church basically agreed to demands from the ACLU to cease any form of acknowledgement that the historic Martin handcart company was actually a group of faithful Mormon pioneers, and in the future they will be referred to as habitationally-challenged communal seekers of a higher metaphysical plane, seeking refuge from traditional patriarchal tyranny". ACLU lawyers demanded that all signs and artifacts related in any way to Mormon faith be removed at least a mile from the site, which will be designated a "religion-free zone". Visitors to the area will be subject to random interrogation to ensure that harmful religious ideation is not being wantonly encouraged or promoted. All persons or vehicles entering or leaving the monument site will be subject to security checks, and any religious contraband will be confiscated. Those criminals apprehended in the act of speaking about the Mormon religion will be subject to fines and imprisonment. First-time offenders will be permitted to attend an ACLU sponsored anti-religion sensitivity training course in exchange for shorter jail sentences. ACLU lawyers praised the agreement, saying that it was a significant victory for first-amendment rights, marking a new era of progress in the fight for freedom from religion.